Here is a guy, like so many, without a label and without funding who is making a go it of it regardless. 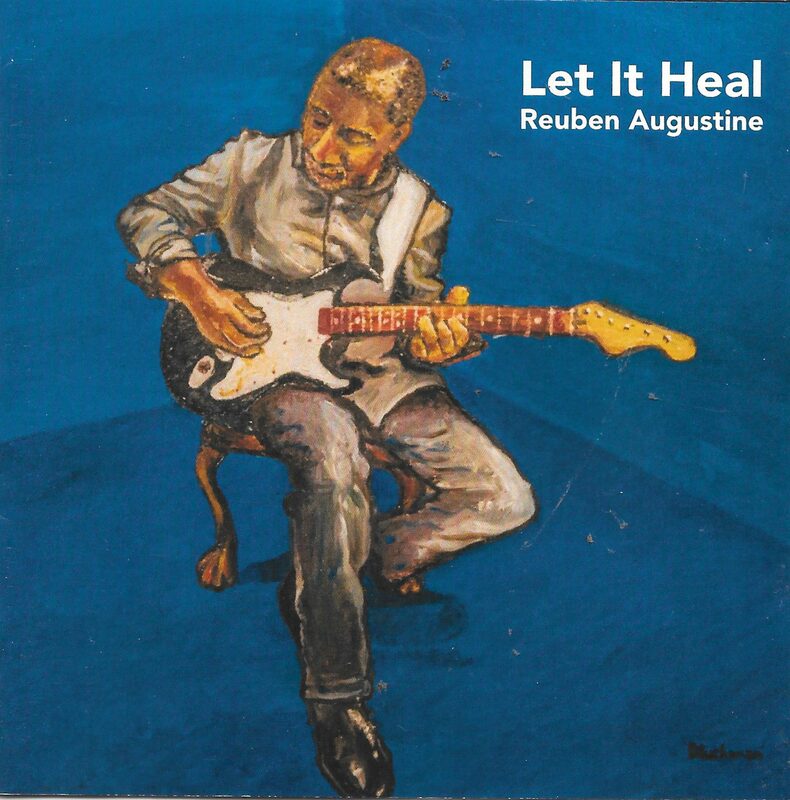 Reuben Augustine is in his late fifties and has been writing for over thirty years and yet this, Let It Heal, is his first album. Even with the wonders of the Interweb, I could find out very little about him; it appears he is a London based singer/songwriter. I cannot find details of any accompanying musicians either: unless he played everything or used Pro-Tools or a similar gizmo. I did find a list of his influences: Seasick Steve; Joe Bonamassa; Tedeschi Trucks Band; Mary Chapin Carpenter; Robben Ford; Eric Bibb; Beth Hart; Anne Sumner; Joe Satriani; Otis Taylor; King Crimson; Rush. Quite a list it is too with a healthy mix of styles. That mix translates into an album of varied rhythms and timings, with equally wide-ranging subjects, as a glance at the track names reveals. The first track, Seven, starts with a beautifully toned guitar exercise before the vocal cuts in without accompaniment and then the band join in: the vocal then changes into a sort of Bryan Ferry singing the blues. A bit disconcerting at first, but it does grow as the instrumentation keeps the attention with its blues and a Celtic mix of sounds. A River is a different beast with its 60s pop sensibilities, the Ferry warble and ‘na,na,na’ sections make it catchy if without a lot of substance. Next up, we get a touch of R’n’B in the guitar phrasing which is pretty good with a tasty bridge section and an inventive solo. The vocal is trying a bit too hard to fit all of the (clever) lyrics into the verses. Angola Free slows the pace with a strong blues flavour; the phased guitar gives it a lift even over the tragedy inherent in the lyrics. Kooky, Kooky Baby has a sort of South Seas feel to it and some strange sound effects. It’s another catchy song with interesting guitar patterns. Medicine Man has a more traditional structure of acoustic guitar and ‘strings’: the heavy electric chords mid-way through give it an unexpected depth. Amy’s Guitar is acoustic strumming with electric counterpoint. Reuben sounds like a Ferry/Donovan hybrid on this one and, again, the instrumentation is the saviour especially as, in the final minute it suddenly speeds up and nearly rocks (the King Crimson influence I’d guess). The title track, Let It Heal, has a really clever little riff in the background but the overuse of the crash cymbal detracts from it a lot of the time. Birdie Loves Reggae is…not really reggae apart from the backing keyboards, and is the weakest track on the album. Jubilee, however, is much better as it uses a true blues timing and rhythm and the guitar takes some unexpected side roads to keep it different. The purposely discordant, short solos are pretty good. Final track, Roses, is the best of them all with an Eastern feel as a sitar sounds plaintively in the background. It has a real atmosphere and Reuben’s voice sounds more controlled, distinctive and fitting for this strangely captivating song. This is a difficult album to categorise and sum up…Reuben’s vocals take some getting used to and, for me at least, there are not enough solos from any instrument to give breadth and breath to some of the songs. In saying that, this is a great achievement by one man and he is to be congratulated on living his dream. I would think that a greater emphasis on his playing prowess and a more varied vocal approach will make his next release worthy of the real potential he has demonstrated here. Thank you so much for the review of my album Let It Heal. Your careful consideration as a blues aficionado is deeply appreciated. When I get the chance to record another album this critical opinion will be a valueable guide. Reflecting back there’s much that could have been done better and my inexperienced clearly shows; I wanted to get it out my system. Still, I’m glad I started even at this late age. Ferry/Donavan is a new comparison! Performing live I’ve been compared to Ted Baker and Richie Havens. I’m just the smallest of minnows on the Open Mic circuit and – yes – there’s very little out there about me. I’ve identified a small group of fans and hope to properly gig for them. Through Blues Doodle I’ve discovered Myles Kennedy and his album release Year Of The Tiger. I thoroughly enjoy its energy and play it on long drives. Once again Liz, thanks for your help and suggestions.